Preheat oven to 375 degrees. Heat 3 tablespoons olive oil in a large skillet over medium heat. Add leek and garlic, season with salt and pepper, and cook until soft, about four minutes. Spread in a 9 inch gratin or round baking dish. 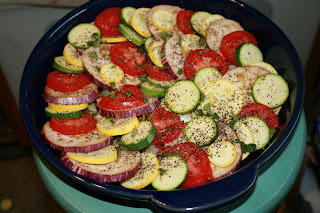 Arrange vegetables on leek in slightly overlapping circles, alternating zucchini with squash, tomatoes, and eggplant. [This is the point at which you would stop, if you were making this in advance; just cover with foil and refrigerate overnight. The eggplant may brown a bit but it will get brown when you bake it anyway. ]Top with wine, 1 tablespoon oil, oregano, salt, and pepper. Bake 30 minutes. Drizzle with remaining oil. 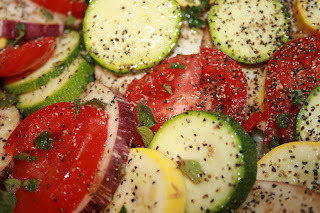 Bake until vegetables are tender, 30 minutes more. Serve with Parmesan. I love the new logo. You have a great staff. You might want to invest in a better lens. It's from Barefoot Contessa. The Paris one. I've been meaning to try this one out!